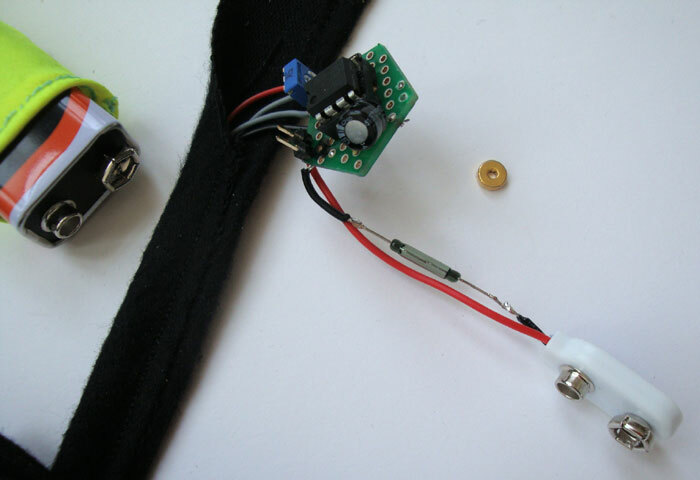 we experimented with a simplified drawdio, then we combined this bit of electronics with a first glove the cyclist glove. To make this terribly designed monster more fashionable, by-wire.net made another fine glove. 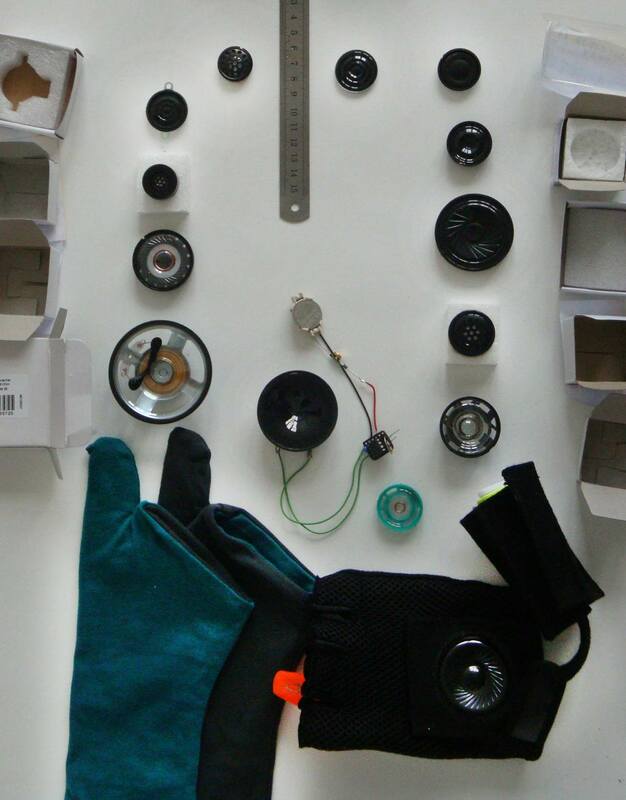 We had to find the right kind of small speaker, and we used a button cell and a 555 3e timer chip to get the parts smaller. 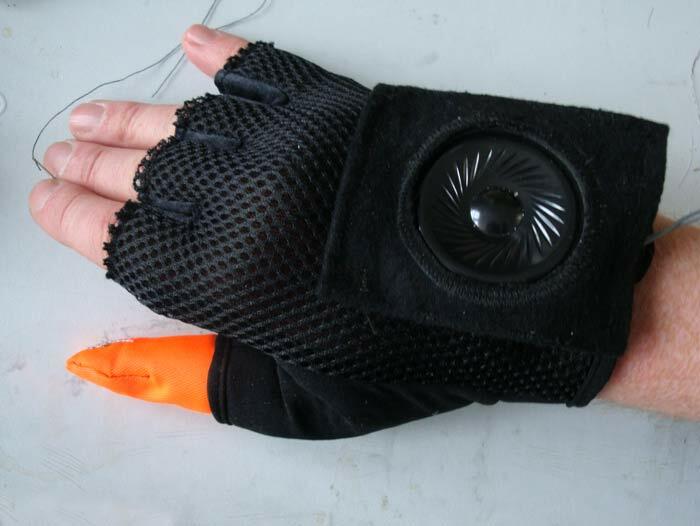 But fitting the electronics in the fashionable glove, and especially with the conductive thread we ran into trouble: cotton is the wrong material for sewing conductive thread on. It triggers all the time. 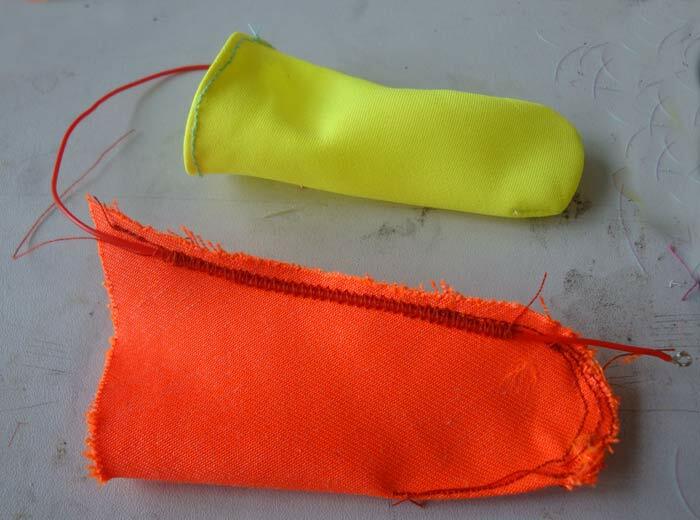 Experiments with other cloth…(The orange material for the first glove worked! )…to be continued. 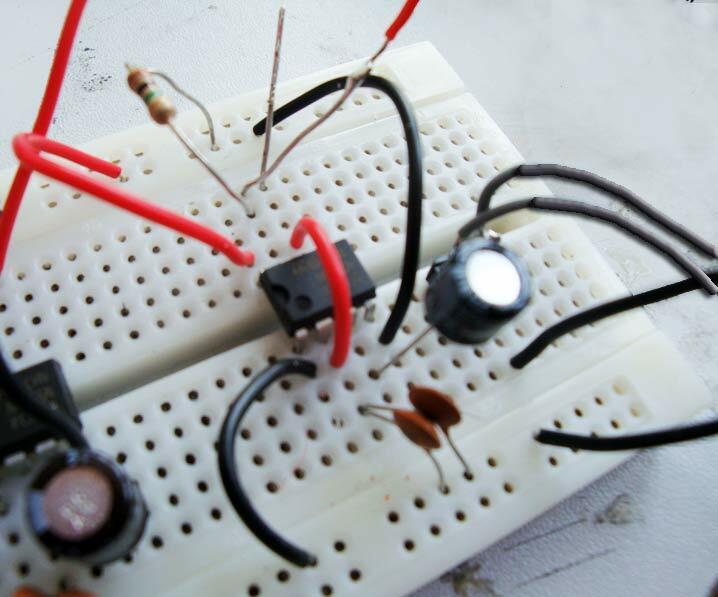 In the end, putting it together on a breadboard I reduced the complexity a bit, making it a game between the resistor and the capacitor. Eventually choosing for a 22pF (also used for the oscillator when making a stand-alone Atmega168) and a resistor of 270K. 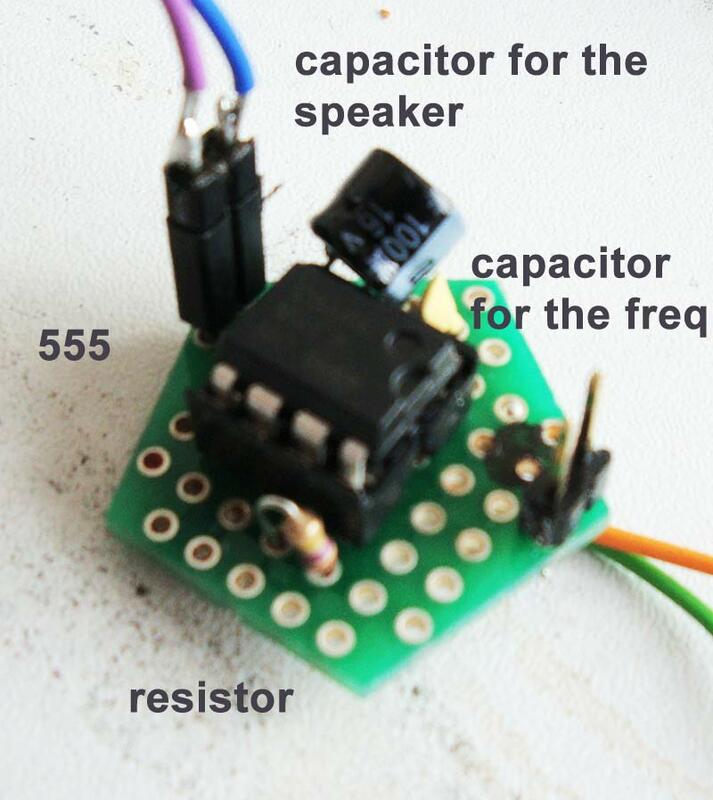 it really is about the relation between the cap and the resistor, which can be placed opposite the each other on each side of the 555 on the breadboard. This starts getting interesting when you have a few capacitors and resistors to play with. 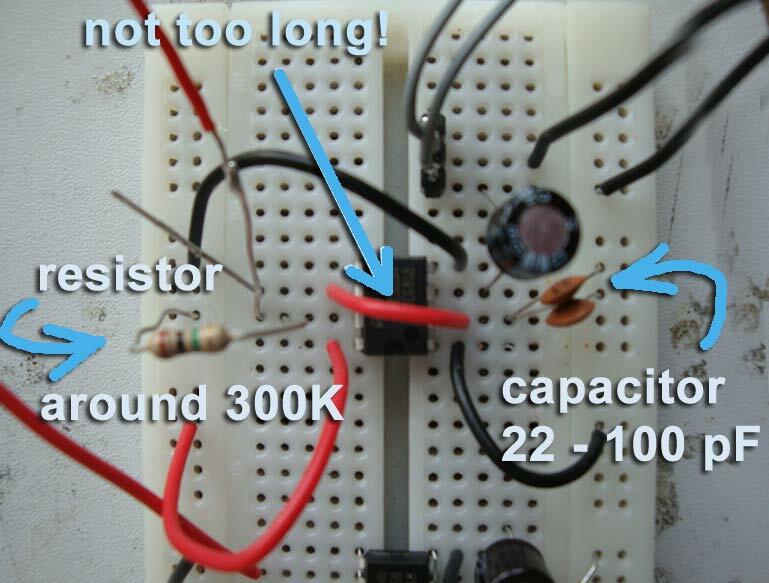 The 22pF mentioned above can become even 220pF, making more difference then the value of the resistor, this one can vary between 100K and 2000K. 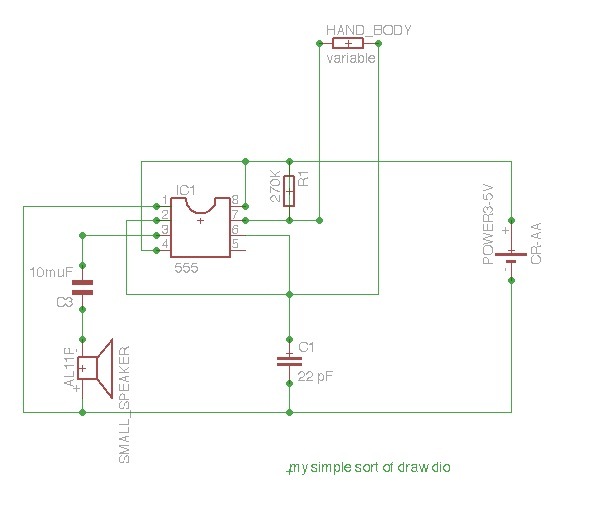 Important is to keep the connection between pin 2 and pin 6 short, because this wire influences the capacitance of the 22 – 220 pF. of course soldering it reduces the wires even more and this improves the sound effects. 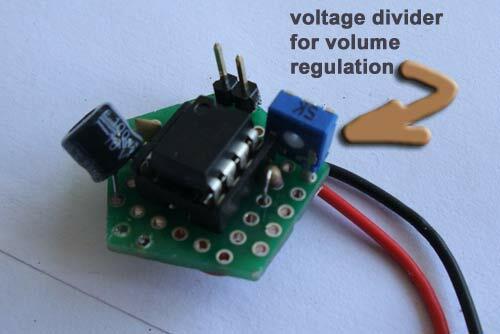 We tested if the drawdio would work on two small button batteries of 3V in series, but it didn’t! // But this is all boring if it remains only technical stuff. wait a moment! We have a few ideas…. Terrible sewing! 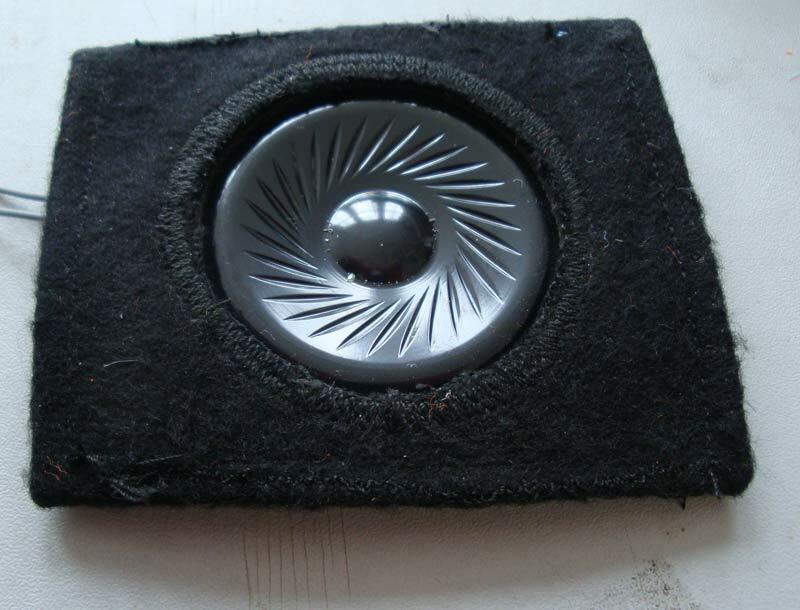 🙂 This thumb has to go…..
First we start with a thumb, consisting of two layers, and the outer layer has an simple embroidery of a LED, of conductive thread. ou can see the wire leading up to this embroidery in the picture with the yellow and orange. So we have a thumb, isolated which can touch the fingers. 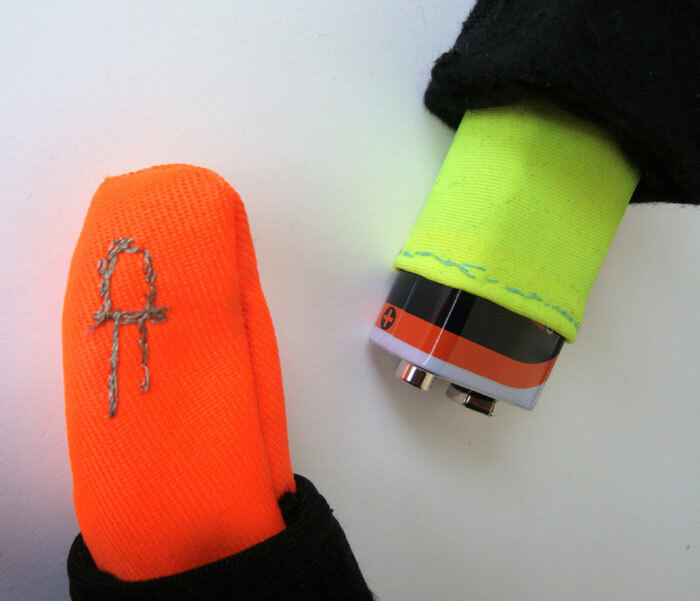 The hand is connected to one wire of the drawdio, and the embroidery on the thumb can touch the fingers making the typical drawdio sounds: screeeck!!!!! The battery will be fitted in the sleeve, we still have to hide the small pentagonal board and test!!! Two other details make it more convenient: the battery will be a 9V and this will give a hard sound, so a small voltage divider will be fitted before one of the wires of the speaker. Secondly it should be possible to switch of the battery, but a switch is hard and the glove tissue is soft, so we use a magnetic reed switch, and a small magnet: magnet against the reed: current, magnet away: no current. Some pictures of putting it together, the battery also has a yellow pyjama to insulate it from the small board with the 555. The reed switch is soldered into the battery wire and the magnet fitted to the cloth surrounding the battery and the board. This big 9V battery is replaced by the small button cell for the second glove, in combination with 555 3E timer chip…you have less noise, but that is ok.
We changed the color of the thumb, orange being nice, but also the color of the national soccer team. We hate soccer! 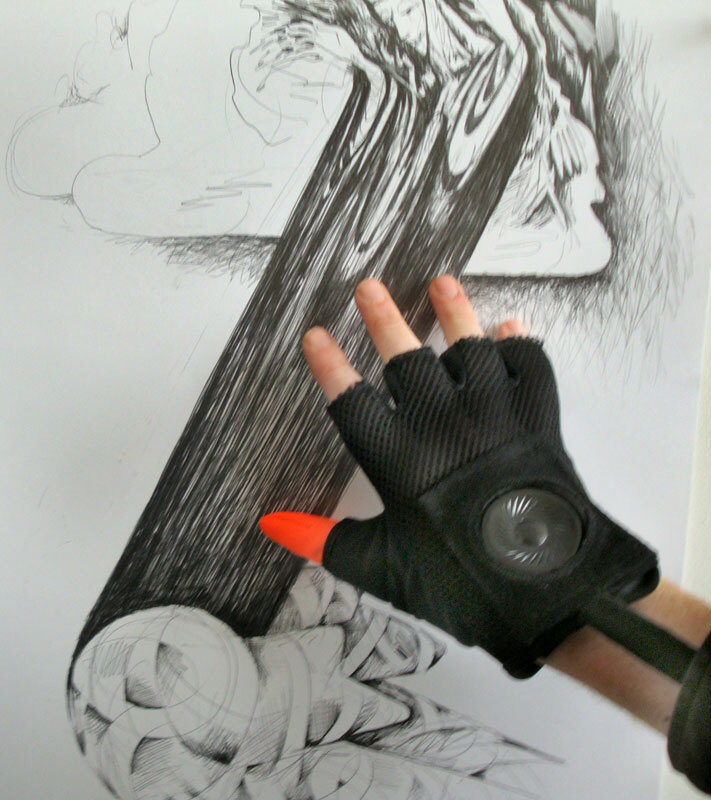 The second version of the glove will be very stylish! 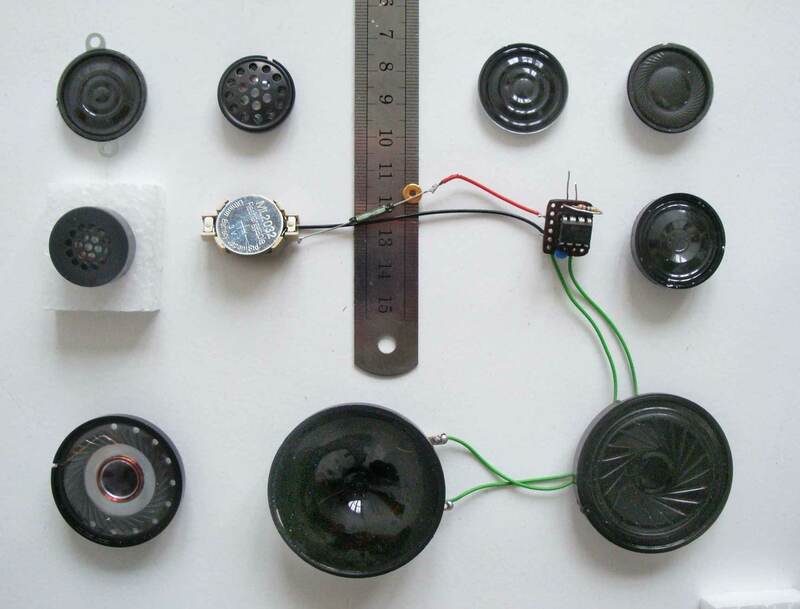 We will take the small speaker above the button cell. This speaker is also protected with a layer of hard plastic. The others have a vibrating ultra thin layer of plastic which is easily damaged. The small speaker gives a nice subtle female kind of draw-dio squeek. We continued with the glove from by-wire.net. 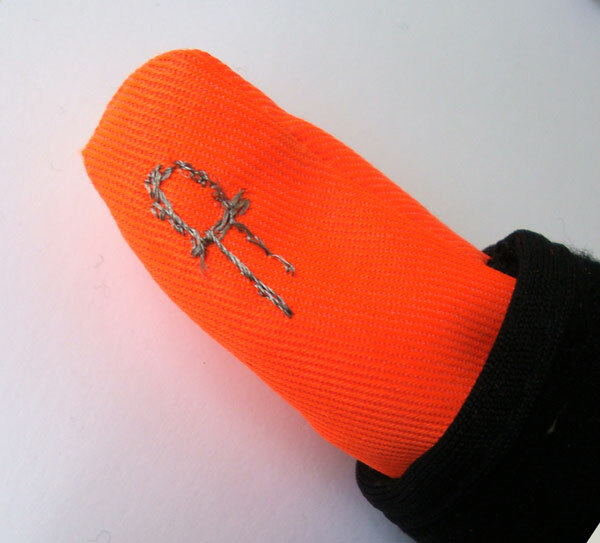 We embroidered the thumb with conductive thread, for the first contact spot. We used conductive thread and we had a problem: we got a tone from the drawdio all the time. The glove is made of cotton and this in combination with conductive thread apparently gathers static electricity which is reinforced in the 555 circuitry. We have had this problem before. So now we have to do a little survey which cloth to use for this kind of experiments. Cotton is out!